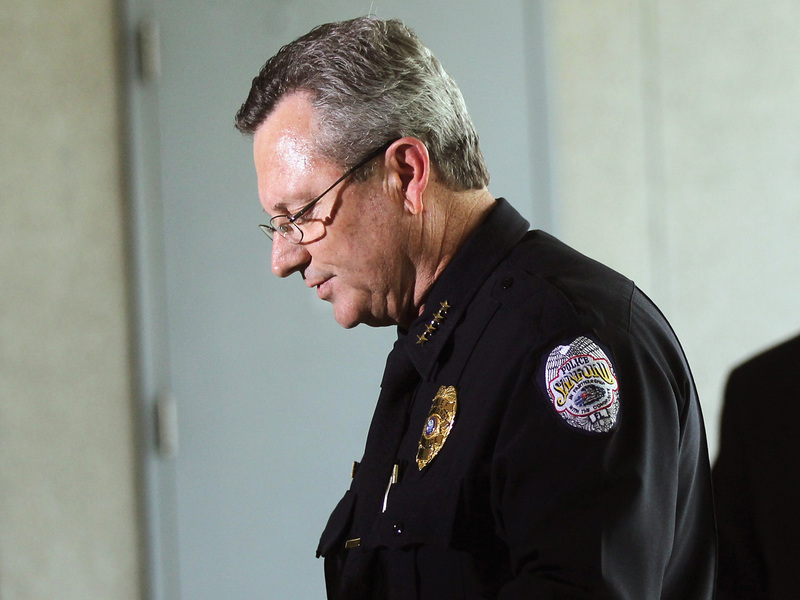 (CBS/AP) ORLANDO, Fla. - The Sanford city commission rejected the resignation of the police chief harshly criticized for his handling of the Trayvon Martin case. Florida law gives people broad leeway to use lethal force if they believe their lives are in grave danger. The Feb. 26 shooting sparked protests nationwide, as well as debates about the laws and race. Martin was black; Zimmerman is the son of a white father and Hispanic mother. Sanford Mayor Jeff Triplett had called a special meeting with city commissioners to vote on the resolution, which would have allowed City Manager Norton Bonaparte to execute the separation agreement for Lee, reports CBS affiliate WKMG in Orlando. Under the agreement, Lee would have resigned from his post, effective at midnight, according to the release. Lee will stay on administrative leave until the outside investigation is completed. Lee had temporarily stepped aside as chief March 22 after enduring strong criticism over his department's handling of the Martin case. Police did not initially charge 28-year-old George Zimmerman, a neighborhood watch volunteer who claimed he shot the 17-year-old Martin in self-defense. Prosecutors later charged Zimmerman with second-degree murder. "The city has experienced great turmoil in the past two months and we are hoping to stabilize the department and continue with this time of healing," said City Manager Norton Bonaparte. Zimmerman was charged with second-degree murder earlier this month, 44 days after the fatal shooting. He was released from the Seminole County Jail in the middle of the night on $150,000 bail. The neighborhood watch volunteer was wearing a brown jacket and blue jeans and carrying a paper bag as he walked out of the Seminole County jail around midnight Sunday. He was following another man and didn't look at photographers gathered outside. The two then got into a white BMW and drove away. Zimmerman did not speak as he left the suburban Orlando jail. His ultimate destination is being kept secret for his safety. He could leave Florida. Zimmerman fatally shot Martin inside the gated community where Zimmerman lived. Martin was unarmed and was walking back to the home of his father's fiancee when Zimmerman saw him, called 911 and began following him. A fight broke out  investigators say it is unknown who started it. Zimmerman was not charged for more than six weeks, sparking national protests led by Martin's parents, civil rights groups, and the Revs. Jesse Jackson and Al Sharpton. Martin was black; Zimmerman's father is white and his mother is from Peru. Residents in Sanford hadn't been expecting a ruckus once Zimmerman was released. Zimmerman was fitted with an electronic device when he was released Sunday, according to a statement from the Seminole County Sheriff's Office. That would allow law enforcement to monitor him if he leaves the state. Defense attorneys for other high-profile clients who awaited trial on bail have said Zimmerman should leave Florida and refrain from going out in public. About a half-dozen photographers and cameramen camped outside the Sanford jail Sunday, focused on the door marked "Bonds Rooms," where other people who had been arrested and released on bail exited. Sanford Commissioner Patty Mahany, whose district includes the neighborhood where Martin was killed, said Sunday that things had calmed down. "I think now that people are able to see the justice system taking place, even though they understand it's going to be quite slow, people are willing to just remain calm and really we're all getting back to our daily routines," Mahany said.